Though many young people and children form part of the Gen HD, some “old” folks are part of it as well. It’s not easy to go unnoticed when you go about doing your business but to notice this new breed of people. They form this new generation called Generation Heads-Down or Gen HD in short. As the name suggests, you won’t see their faces as they tend to look down busy fidgeting their gadget trying to keep themselves and friends posted on the latest happenings in their lives. Most of them doing this heads down when they are in a restaurant or in a waiting room or at a bus stop. But they are some who have mastered the zen-like skill of swiping the gadget and walking at the same time. And this includes many young children too. Too bad for J and K, they are not allowed to join the Gen HD. Because they have an outdated dad. Yes I don’t even have a smart phone or iPad to let them play with. Even if I did, I wouldn’t let my kids play with it, especially during mealtime. I don’t know why but I am very against it. Not that I don’t like gadgets but there’s time for them and there’s also time you chuck them away. You can’t let your child stick to the gadget like glue 24/7. There’s a limit how long he can play with it. 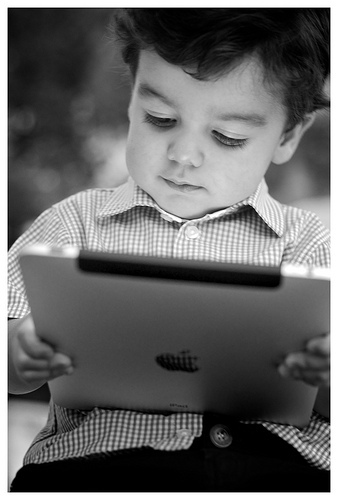 There’s more to life than iPad. Learn from nature (say birds or cats or dogs). Focus on what you are doing on hand and keep things simple. That is to say when you have dinner, focus on dinner. Not the gadget. And of course, the people around you. You can’t just keep your head down and ignore them! This has to start from the parents and the kids will follow. I have a friend who initially let her kids play the iPad while having meal. Later she felt something was wrong. She decided to do away with the gadget during mealtime. Of course, as expected, her two sons protested like hell. But after a few rounds of explanation and she insisted her stand, now her children are okay to have meals without the iPad. They have canceled their membership and no longer part of the Gen HD. I witnessed that when we had lunch with them a few days back.